Most shipping container customization plans will involve adding windows, doorways, vents or even opening up a side wall. Cutting Cor-Ten steel although not as easy as cutting wood can be done with a number of different tools that you may have available in the typical handyman's tool box. First and most importantly is to protect yourself while working with cutting tools. No matter what tool you select, the cut steel will have very sharp edges; wear a pair of heavy leather gloves like those designed for welding. The cutting operation involves sparks and metal shavings, wear eye protection! The tools are loud and the steel shipping container will increase the noise, wear good hearing protection! Also wear a heavy long sleeve shirt and long pants. I know that may not always be pleasant however it sure beats hot metal shavings landing on you. Speaking of landing on you, shipping containers are constructed from 12 gauge steel, approximately 1/8″ of an inch thick. A big piece of this stuff like from a door opening will be heavy, be careful when finishing your cut to make sure a heavy piece of metal with razor-sharp jagged edges will not fall toward you and injure you. To begin, use a sharpie type marker to clearly draw edge of your opening on the container steel. If cutting an opening on shipping container isn't or will not develop into a frequent practice for you then you can use a saws-all or reciprocating saw with a heavy steel cutting blade. Save yourself some frustration here, don't buy cheap blades, they're cheap for a reason, this is heavy-duty work and you want several heavy-duty blades available. Drill a hole on the inside of the line of your marked opening big enough for the saw blade, put your blade in the hole and begin cutting along your line. You can also use a skill saw with a good meal cutting blade. To start your cut, first set the blade on top of your mark to get lined up. Lift the rear of the skill saw up enough so that the blade leaves the container surface and start the saw blade, slowly ease the saw blade down to your mark until the blade cuts through the steel then follow your line. You'll have to repeat this process when you come to the corners as a skill saw does not turn. Don't panic in the event you wander off of the line a little bit with either of these cutting methods, any error can easily be fixed. Those who cut this type of steel on a more regular basis should have a torch available, or the ultimate field cutting instrument, a plasma cutter in the tool arsenal. These will be much quicker and simpler than saws and much less fooling around when turning corners. You can rent these tools at most equipment rental locations but practice on some scrap metal before you begin cutting on your container. 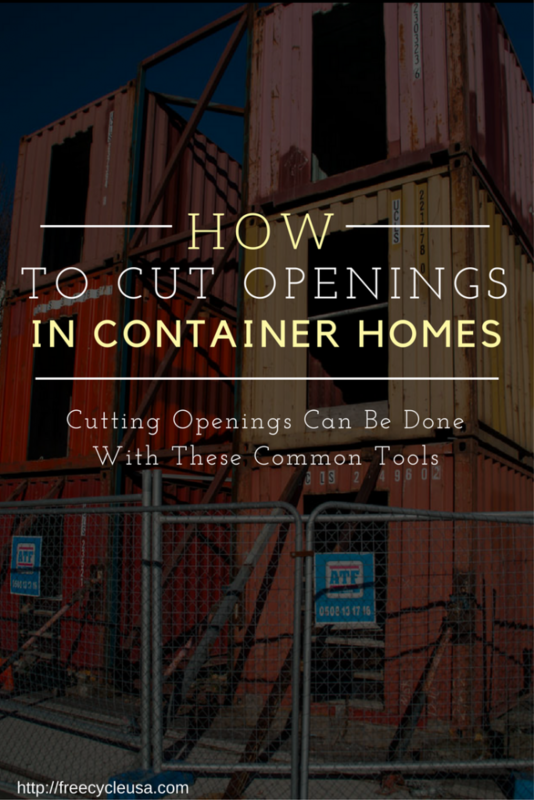 While its heavy-duty work, cutting openings in shipping containers isn't hard and can be accomplished with any number of tools, just do it – carefully, and the easiest for you method will come to you.